Most of these 'Story A Week' stories are written on my computer at home, and usually a few weeks in advance, but this one is a bit different. It is coming to you almost 'live', and I am thousands of miles away from my home. It is now Saturday; the story is supposed to be ready for tomorrow morning, and I am in Vancouver on a visit to my family. In recent years, we have been getting together at least once a year; I fly over from Tokyo, my brother comes in from Germany, my sister and parents live here in Vancouver, and - at least for the present - both my daughters are here too. May isn't really the best time for us to have this annual gathering. The weather is still too cool for spending much time on the beach, and the fruits and vegetables in the garden allotment that Himi has access to are not yet ready. We usually meet up a bit later in the year, when it is more comfortable. This time though, the timing was out of our hands, as the date was determined by daughter Fumi's schedule. Her university was holding this year's graduation ceremony this week, so this week it had to be! 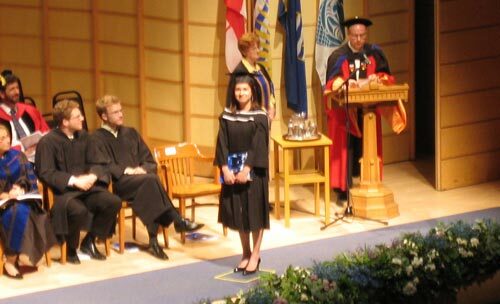 Yes, it's graduation time; my little daughter Fumi has finally come to the end of her years of formal education, and just the other day we all went out to the campus to watch as she was presented with her degree. It was quite a strange feeling for me visiting the university for the ceremony, for this is the same institution that I myself attended nearly 40 years ago. As we walked across the campus towards the convocation hall, passing many of the same buildings in which I had sat for classes all those years ago, it was interesting to think about the different way that the two of us approached our education here. I had been eager and enthusiastic at first, but was unable to maintain that enthusiasm for long. The university had - of course - a complete curriculum laid out for us to follow, but I seem to be the kind of person who loses interest when being told 'what to do', stopped attending some of the courses, and never returned after the first year. Fumi on the other hand, although also sharing my characteristic of wanting to work things out for herself as much as possible, had more patience with the 'system'. She set herself the goal of getting a degree, stuck to it, and worked far harder at her studies than I ever did, with the result that she took her place on the stage with the rest of her class at this graduation ceremony. What is interesting to note, is that she also played harder than I ever did, and had a very full social life during these four years, making many new friends and enjoying many extra-curricular activities. Some of this was difficult for me to understand, and sometimes, when I saw photographs or heard descriptions of ever more partying, I wondered if perhaps she was headed for the 'exit' too! And then on top of all those distractions, she also kept up a very busy schedule on a part-time job, so was able to pay many of her own expenses along the way, supplementing the basic support she was receiving from her parents and grand-parents. I have no idea how she found the time to do all these things, especially as she came out with very good grades all along the way. I don't know if getting one's education is supposed to be any kind of 'competition' between parent and child, but if so, then this was one that I am glad to have lost. Now let's see what she goes on to make with it!